Between Twitter, Facebook, Snapchat, Tumblr, and plain old email and HTML, there are more ways than ever to spread hateful, disgusting speech. And yet there are some pieces of campaign paraphernalia that are just so classic that it’s hard to let them go. Allow me to introduce campaign buttons in the era of Donald Trump. 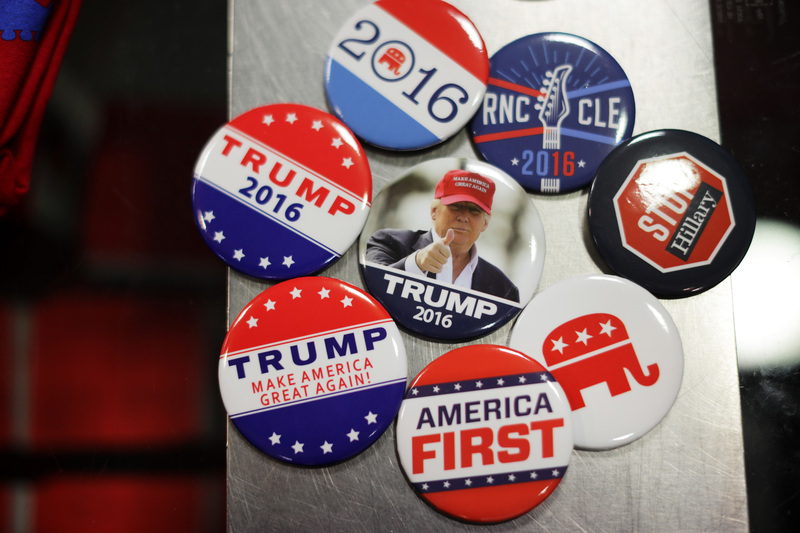 Campaign buttons have a long and storied history. They reach all the way back to the beginning of the republic, when George Washington’s supporters wore copper buttons with the his initials on them. Abraham Lincoln became the first president to have a button with a photograph of his face on it, and by the end of the 19th Century, buttons were being mass produced as campaign devices. Fast-forward to today, when anyone with a couple hundred bucks and a dream can make their own buttons by the dozens. And my, how the supporters of presumptive GOP presidential nominee Donald Trump (and opponents of presumptive Democratic nominee Hillary Clinton) have risen to the occasion! Bustle is on the ground in Cleveland, and we found eight buttons which really cut to the core of what’s wrong with the 2016 race. And we’ve organized them from least to most offensive. To start off, we have one that is surprisingly tame, given the rest of the bunch. While I don’t agree with the statement, I can at least acknowledge that thinking Clinton should face prosecution for the email scandal is something we can disagree about reasonably. This one is only slightly more offensive, partially because of the drawing, but mostly because of the spelling of “qualiteeprinting.” But I’m sure they’re great people. I considered putting this one lower down, but the notion that Clinton is simply being manipulated by a (undeniably male) hand bumped it up. That being said, this almost qualifies as a thoughtful political cartoon, and look how adorable Chibi Trump is, giving Washington the finger! I might wear this ironically (by myself, at home, with all the lights turned off). Even if we try to steer clear of attempts to impose absolutist notions of “hotness” and how they might somehow be ludicrously related to one’s political tendencies, this one is also upsetting purely for having too many different fonts. And also, everyone should love who they want, but seeing pink hearts on either side of Trump’s name makes me squirm. But hey, way to get out the vote! See above re: absolutist notions. Otherwise, somebody call the SPCA, because this elephant is clearly being held against her will. Is it supposed to be one of the pretty women? Or is it just being used as cute-bait? I’m going to be magnanimous here and not pop an aneurism over the missing apostrophe, only so I can focus on how (as with all "Black Lives Matters" ripoffs) this massively misses the point of Black Lives Matter, and therefore is super racist. I almost feel like trying to deconstruct this might accidentally lead to my unraveling the fabric of the Universe, but well, here goes. (1) Is KFC endorsing Clinton? Or are they just here because of chicken? Why couldn’t it be Church’s? (2) There doesn’t seem to be a deeper message here, other than “We are judging her body” and she’s liberal. Don’t worry; I get the chicken pun. I just don’t know that it’s expanding the conversation at all. (3) What is up with that ellipsis? Is that, like, the pause before the punchline? (4) It doesn’t actually say anything negative about being left wing? I could see a universe where Hillary does an SNL bit in which she eats chicken, based on this button. There you have it. Eight buttons straight from the RNC that manage to be offensive while saying nothing substantial at all.